Electra Meccanica CEP Jerry Kroll introduces the single-seat Solo commuter car. 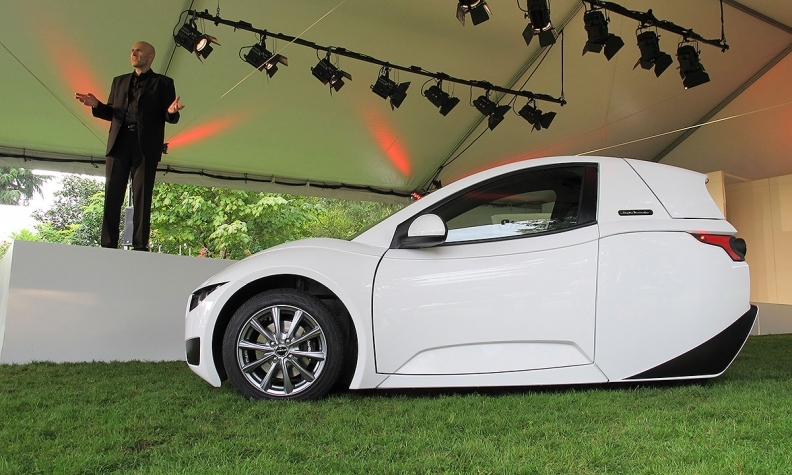 Electra Meccanica officially debuted its Solo single-seater commuter car EV at the Vancouver Luxury and Supercar Weekend, Sept. 9. The three-wheeled runabout has a claimed top speed of 130 km/h, a 160-km range and carries a $19,888 asking price. The car unveiled at a media preview Friday is destined for crash-testing, partner and chief engineer Henry Reisner said, in order to be certified for Canadian roads. Trikes are exempted in the U.S., where along with other foreign markets the company expects to sell most of its production. Electra Meccanica CEO Jerry Kroll said more than 200 customers have put down a $250 refundable deposit and the company has had more than 20,000 inquiries. Initial production from its New Westminster, B.C., facility should start reaching customers before the end of the year. Kroll has hopes of eventually reaching 100,000 annual production from plants in Asia, and has asked the federal government for assistance to ramp up production in Canada.